1. ‘Communicative’ implies ‘semantic’, a concern with the meaning potential of language. 2. There is a complex relationship between language form and language function. 3. Form and function operate as part of a wider network of factors. 4. Appropriacy of language use has to be considered alongside accuracy. This has implications for attitudes to error. 5. ‘Communicative’ is relevant to all four language skills. 6. The concept of communication takes us beyond the level of the sentence. 7. ‘Communicative’ can refer both to the properties of language and to behavior. This is closely linked to the first, and concerns the relationship between the grammatical forms of a language and their communicative function. In more traditional teaching materials, this complex form-function relationship tends to be simplified, often implying a one-to-one correspondence, so that ‘interrogatives’ are used for ‘asking questions’, ‘imperatives’ for ‘giving commands’, ‘conditionals’ for ‘making hypothetical statements’ and so on. In a communicative perspective, this relationship is explored more carefully, and as a result our views on the properties of language have been expanded and enriched. However, there are a number of pedagogic problems associated with this approach to materials design, particularly to do with the sequencing of the language to be practiced. It is possible for most teachers to think of classroom situations where grammar practice takes place with very little reference to everyday reality, where learners rehearse patterns simply in order to get them right rather than to express meaning. Equally, it unfortunately is just as possible for a list of language functions to be practiced as ritualistically as grammar with, say, a few structural items for ‘giving advice’ applied in turn to imaginary people and situations. We need, then, to be a little cautious here, because there is no reason in principle why grammar practice should not be placed in a communicative context, and functional practice take place only as a list of separate and decontextualized items. Language function and language form, then, do not operate in isolation but as part of a network of interconnected factors, all of which need to be taken into account in materials which use a communicative concept as their design principle. Once we move away from the idea that mastery of grammar = mastery of a language, we are obliged at the same time to move away from evaluating our learners’ proficiency on the basis of accuracy alone. It is undoubtedly desirable that their language production should be as ‘correct’ as possible, but we have seen that grammaticality also takes place in a wider social and communicative context. The implication here is that we should concern ourselves not only with accuracy of form, but also with a appropriacy in relation to the including ‘what a speaker needs to know in order to be communicatively competent in a speech community’ (Richards and Rodgers 1986: 70). The communicative approach has therefore led to a broadening of the criteria by which language proficiency is defined. We now have the concepts of appropriacy as well as accuracy, communicative as well grammatical competence, use as well as usage (Widdowson, 1978). It is important to realize that ‘communicative’ can in fact refer to four language skills. We can look at this in two different ways. Firstly we can divide the ‘four skills’ into ‘productive’ (speaking and writing and ‘receptive’ (listening and reading) and practice them separately. 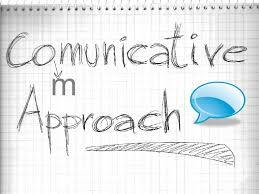 It is possible to do this successfully from a communicative perspective. More usefully, we can group together the oral/aural skills of speaking and listening, and the ‘paper skills’ of reading and writing. In both cases, we have a giver and a receiver of message, and the ways in which the information in the message if understood by the receiver is an integral part of the communication. A concept of communication does not have to be based on sentence-level criteria, and it can allow language to be described, and language learning to take place, over longer stretches. In principle it can handle whole conversations, or paragraphs, or even longer texts. In recent years, a number of categories for describing language have been developed that are not based of sentence-level criteria, but on the broader notion of ‘discourse’. There is a large and growing background literature on ‘discourse analysis’. Essentially, the notion gives us the possibility of showing how different parts of a text or a conversation or any stretch of language are interlinked. This may be, for example, by cross-referencing with pronoun use or definite articles; by semantic links across items of vocabulary; by markers of logical development (‘however’, ‘therefore’, ‘so’, ‘because’ and the like); by ellipsis in conversation (the short answers’ of coursebook practice); and by substitution (‘this is my book, yours is the other one’). distinct thought related ways, and the apparent ambiguity has sometimes been a source of confusion because language is seen to have inherent communicative as well as grammatical properties. use what learners ‘know’ about the functions of language from their experience with their own mother tongues.